Here is what the kids and I did this past weekend. 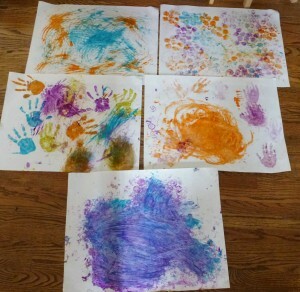 Big sheets of paper and lots of finger paints to create messy art! This is the kind of art I love—messing around with items found in the home and creating textures with them. Another not so great photo—I need a DSLR!! I like the idea of memory lockets—having the names or initials of your loved ones in the locket together with charms/stones that have personal meaning. In my new design, instead of the idea of a personal story, I created a theme: one that would have meaning to a Buddhist or a yogi. Or to those of us who connect to those elements for different reasons. 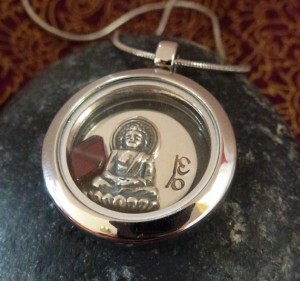 The locket features a sterling Buddha charm, a hand stamped sterling disc and a garnet bead stone. During my travels around Asia in my early-20s, I spent some time at a Tibetan monastery in Nepal as well as a Buddhist monastery in Thailand. I learned many things from the teachers and community at both places. 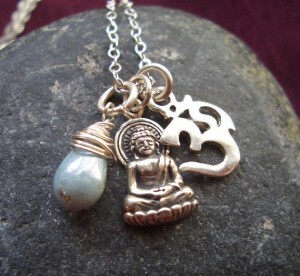 Having the Buddha in a locket inspires me to focus on some of the teachings of the Buddha: to practice compassion and loving kindness. The hand stamped Om always reminds me to stop and breathe and to notice what is happening NOW and the garnet is a beautiful deep red, and in Ayurveda is a replacement to an expensive ruby. It helps to give insight. Find the necklace here.